For almost a decade many runners have been captivated by the issue of running shoe design – a preoccupation fuelled two opposing factors. On the one hand padding is expected to provide protection and in particular, provides shock absorption attenuating the impact of foot-strike. 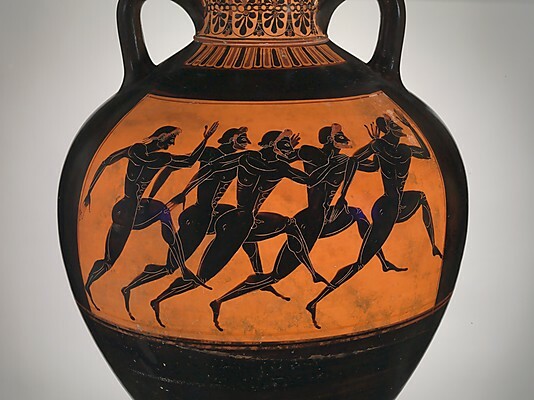 On the other hand, there is the allure of the idealistic notion of barefoot running – based at least partially on the rational argument that if our distant ancestors survived by persistence hunting, the human frame must be well adapted to barefooted running. These opposing influences have led to fluctuating enthusiasm for fashions ranging from barefoot (or minimalist shoes such as the Vibram Five Fingers) to the heavily padded Hoka one-one. In addition to these two opposing influences there is the issue of the effects, either helpful or harmful, that shoes might have on the twisting movements that occur at the joints of foot and leg. 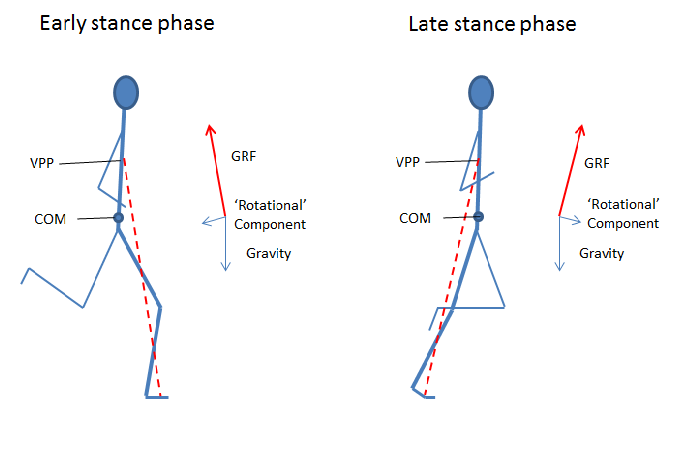 Most notable are the compound motion of pronation occurring at the forefoot and ankle that allows the foot to roll inwards transferring weight onto the medial longitudinal arch as the leg is loaded during stance; and the inwards bend of the leg below the knee (varus deformation) that places pressure on the vulnerable medial aspect of the loaded knee joint while also dragging the ilio-tibial band towards the lateral femoral condyle. Although pronation is a natural movement, shoe companies have placed strong emphasis on the potential dangers of over-pronation. To prevent this, they have marketed motion control shoes with a medial post, a structure embedded in the medial side of the shoe that arrests the inward roll. This affects not only the impact absorbing capacity of the foot, but also modifying the varus torque acting at the knee. The question of high technology shoe design also brings with it the issue of the ethics of unfair technical enhancement of natural ability. While this ethical issue can only be dismissed entirely by adopting barefoot running, it might be argued that in the modern man-made environment, denying at least a modest degree of protection would be unreasonable. In principle there is a difference between basic protection and the overt assistance provided by embedded springs such as in the Spira. However, once any layer of fabric is interposed between foot and ground, there is a continuum of assistance provided depending on the elastic properties of the material. Nonetheless, most runners accept that the assistance provided by the bulk properties of a compressible material primarily designed for protection against either shock or penetrating injury is reasonable. The protective effect of shoes is clearly demonstrated by two automatic responses seen in most habitually shod runners when they change to barefoot running. Self-selected cadence increases leading to decreased length of airborne time during each gait cycle, thereby decreasing the magnitude of the vertical force required to get airborne. Furthermore, as discussed in my recent post on style, foot-strike tends to change. The investigation led by Daniel Lieberman of Harvard University indicates that barefoot runners are more likely to adopt a mid-foot or forefoot strike rather than the rear foot strike typically seen in about 75% of shod runners. This change in foot strike abolished the potentially harmful sharp rise in vertical ground reaction force that is generated by heel striking. Nonetheless, it is noteworthy that avoidance of rear foot strike is not necessarily the case in habitual barefoot runners. For example the study of north Kenyan habitual barefoot runners by Hatala found that 72% were heel strikers at their self-selected endurance pace, though the majority landed on mid or forefoot when sprinting, when vertical forces are greater. 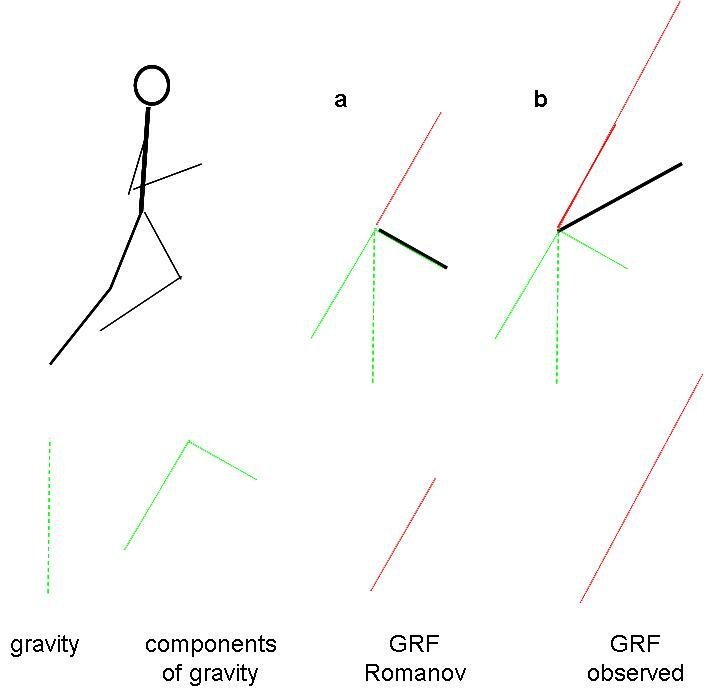 As discussed in the post on style, there is little evidence that fore-foot strike is more metabolically efficient whereas several studies actually show rear-foot strike is most efficient at low speeds. The situation with regard to risk of injury is mixed, with greater risk to knee with heel strike and greater risk to structures around the ankle with forefoot strike. The balance of risks favours a mid-foot strike. Therefore, a shoe style that allows this is preferable. Kerrigan and colleagues reported that the torques acting at ankle, knee and hip occurring in runners wearing Brooks Adrenaline shoes were increased in comparison with barefoot running. The Adrenaline is described as a neutral shoe, meaning that it is not designed to strongly inhibit pronation, and has midsole thickness ranging for 24 mm at the heel to 12 mm at the front. The increases in torque when shod were especially marked for knee varus (increased by 38%); knee flexion (36%) and hip internal rotation (54%) around mid-stance. Only a minor portion of these increases in torque could be accounted for by the lower cadence of the shod runners. Knee varus places stress on medial aspect of knee joint at a site especially prone to osteo-arthritis. It also drags the ilio-tibial band towards the lateral femoral condyle increasing the risk of iliotibal band syndrome. 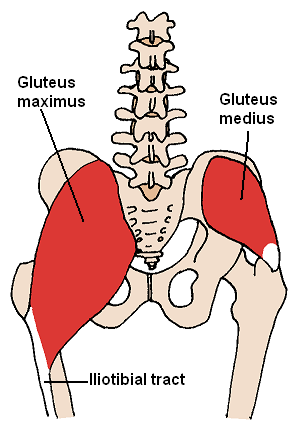 Knee flexion torque flexion places stress on patella-femoral joint and increases load on patella tendon and quads. It should be noted that tension in the patella tendon at mid-stance is not necessarily bad, as it would be expected to increase the eccentric loading of the quads and facilitate the upward drive of the body that occurs after mid-stance. 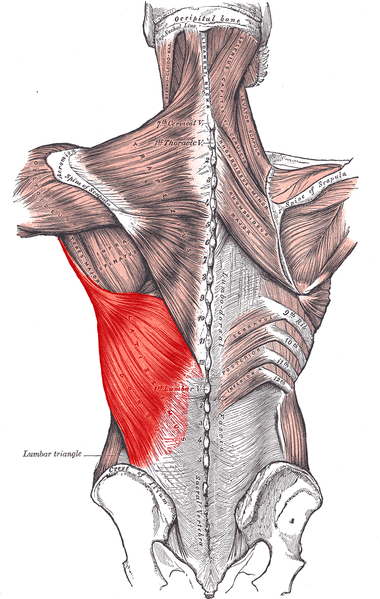 Similarly a moderate degree of internal rotation of the hip is required as the pelvis rotates around the hip joint during stance, so a torque promoting internal rotation torque is not necessarily bad, though it is noteworthy that some runners do develop osteo arthritis of the hip. Elevation of the heel relative to the toe is the most likely explanation for the additional knee flexion torque revealed in Kerrigan’s study of joint torque at the joints. Furthermore despite providing padding, the presence of a bulky heel makes it difficult to avoid localized impact at the heel, and thereby make a substantial contribution in the rapidly rising spike of vertical ground reaction force observed in heel strikers. As shown by Zadpoor, a rapid of rise of vertical force increases risk of injures such as tibial stress fracture. Thus, it would appear that shoes with minimal or no drop from heel to toe that allows initial contact further forwards might be safer, and will tend to be lighter. An interesting alternative is the Healus, a shoe without a heel. A slanted sole ensures that the runner avoids heel contact but instead makes contact via a well-padded mid foot. Force plate data demonstrates that it abolishes the initial spike in vertical ground reaction force. The padding under midfoot provides maximum protection when vertical ground reaction force is at its peak. However, despite an endorsement by former European 5,000m record holder Dave Moorcroft , it does not appear to have achieved much popularity, possibly because it is produced by a small company. The inward rolling of the foot that occurs with excessive pronation has several potentially adverse consequences. The ankle tends to be displaced towards the midline thereby increasing varus deformation at the knee, enhancing risk of iliotibial band syndrome and perhaps also osteo arthritis of the medial aspect of the knee joint. The medial longitudinal arch of the foot is flattened increasing tension in the plantar fascia increasing risk of plantar fasciitis. Thus, in runners with excessive pronation, a shoe with a medial post that limits pronation might be beneficial. However it should be noted that Kerrigan observed increased knee varus torque in shod runners relative to barefoot. The Brooks Adrenaline is a neutral shoe but nonetheless has a modest medial post and hence it might appear surprising that there was increased knee varus torque. However the shoe had not been matched to the specific needs of individuals. It is plausible that the one consequence of being shod was that individuals lacked the sensation and freedom of movement within the shoe required to produce optimal adjustment of the motion at the ankle according to their individual needs. It might be argued that at least for non-injured runners, that light weight shoes or bare feet providing the freedom to adapt the ankle and foot motion according to individual needs and changing surface conditions, would be preferable. Because the shoe is at the far end of the swinging leg, its mass makes a relatively large contribution to energy cost of repositioning the leg during the swing phase. However, there is growing evidence that at least a small amount of padding brings a benefit that compensates for the additional weight. Franz and colleagues from Roger Kram’s lab in Colorado compared oxygen consumption during running barefoot with that when wearing lightweight cushioned shoes (approximately 150 gm per shoe) in 12 runners with substantial barefoot experience, running with midfoot strike on a treadmill. In additional trials to determine the effect added weight, they attached small lead strips to each foot/shoe (150, 300, and 450 g). They found that in the absence of added weight there was no significant difference between shod and unshod running. Adding weight led to an increased metabolic cost of 1% for each 100 gm of added weight. When adjusting to equalise mass in shod and unshod condition, shod running had ∼3%-4% lower metabolic cost. In a further experiment for the same lab, Tung and colleagues measured the metabolic costs of barefoot running on an unpadded treadmill and after adding strips of padding of either 10mm or 20 mm thickness to the surface of the treadmill. They also measured the costs of running shod in lightweight shoes on the unpadded treadmill. They found that when running barefoot, 10 mm of foam cushioning (approximately the thickness of the forefoot shoe midsole) afforded a benefit of 1.91%. There was no significant difference between metabolic costs of shod and unshod running on the unpadded treadmill, indicating that the positive effect of shoe cushioning counteracts the negative effects of added mass. Thus, running barefoot offers no metabolic advantage over running in lightweight, cushioned shoes. The explanation for this remains speculative. 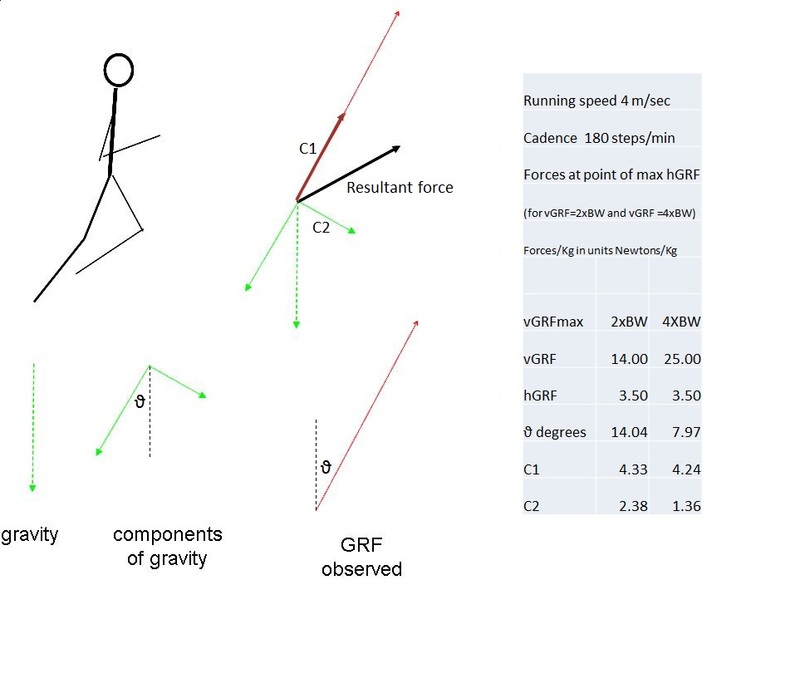 One possible explanation is that when running barefoot, a runner maintains a lesser degree of stiffness in the legs, resulting in less efficient capture of impact energy as elastic energy, in the same manner as a floppy spring produced a less efficient recoil that a stiff spring. While light weight shoes might offer adequate protection in short and medium distance events, it is necessary to consider the possibility that in a marathon or ultra-marathon, the cumulative damage from repeated eccentric contraction will result in a significant loss of power. A little more padding might protect against this loss of power. 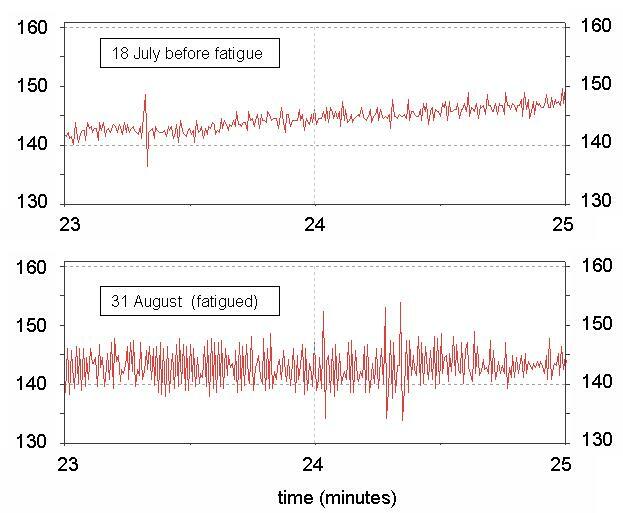 Similar issues apply during periods of high volume training. Last summer, while training for a half-marathon, I built up my total training load to a substantially higher volume than during any recent year and found that I suffered a gradual accumulation of aches in my legs. 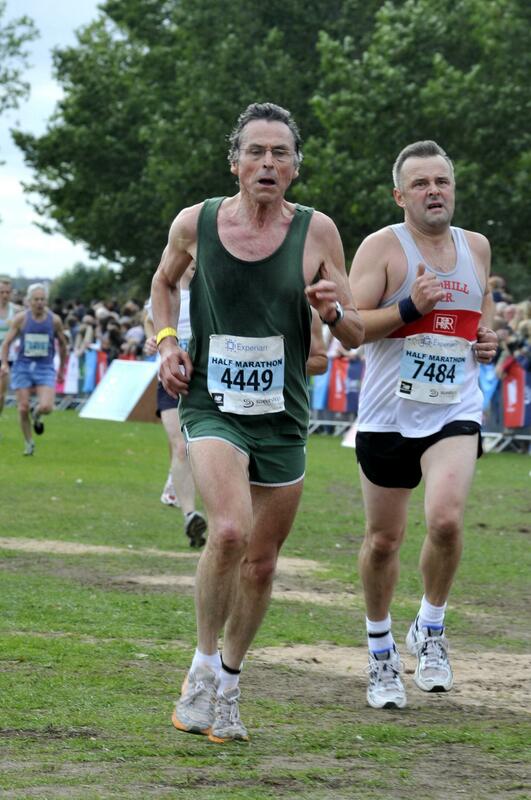 Hence, at least for an elderly person, light weight shoes should be employed sparingly, but nonetheless, frequently enough to produce the adaptive changes required if they are to be used for racing. You are currently browsing the archives for the Running Mechanics category.